As another anniversary the Sept. 11, 2001 terrorist attack approaches, Owego, Campville and Apalachin, and other Tioga County Fire and Emergency personnel will again pay solemn homage to the victims with a ceremony steeped in reverence and remembrance. Especially remembered is former Town of Owego Apalachin resident Derek James Statkevicus, son of Joseph and Nancy Statkevicus. He was a Vestal High School graduate and Eagle Scout with Apalachin Troop 43. Derek was employed by KBW Bank and was on the 86th floor of the World Trade Center, South Tower. First Responders say there is simply nothing more honorable, more courageous, or more heroic than someone giving their life so others can live. The annual ceremony is a small way for us in Owego to remember those who made the ultimate sacrifice on 9/11. 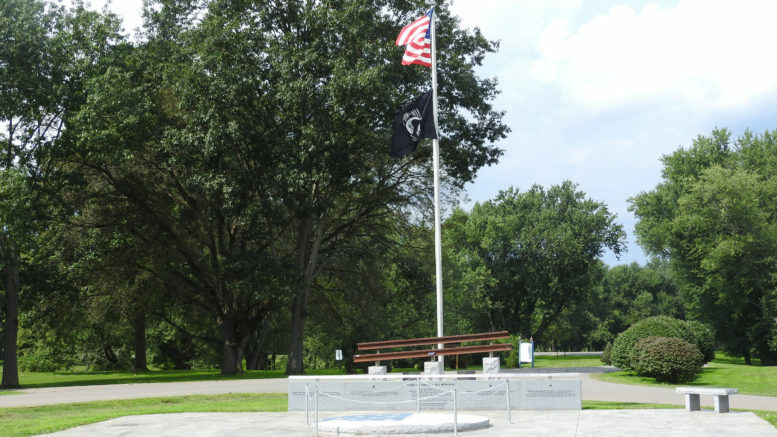 The ceremony is scheduled for Tuesday, Sept. 11, starting at 8:46 a.m. at the Town of Owego 9/11 Memorial in Hickories Park, not at the Fireman’s Statue located in Owego. Campville Fire Department’s aerial ladder will display a large American Flag near the 9/11 Memorial. Those participating in the 9/11 Memorial Program are asked to be in the park by 8:30 a.m.
Owego Fire Department Chief Dan Gavin says the remembrance ceremony will honor 343 firefighters, eight EMTs, 61 police officers and 2,581 civilians. Tioga County responded to 9/11 with EMTs, firefighters and police officers to fill spots left by their fellow emergency service teams, firemen and police officers. New York State Police Investigator Jeremy Allen will play the bagpipes, a traditional part of solemn firefighter events. The American Flag will be lowered to half staff by the Honor Guard of the Glenn A. Warner Post 1371, Veterans of Foreign Wars. The remembrance ceremony will remember the seven who in past years gave their lives for the safety of Owego citizens. They include Owego Police Department Officers Isaac Wiltse and F. Allen Hall; and Owego Fire Department’s Ray Wiltse, Winifred Knap Sr., Richard Beck, Steven Gavin and Matthew Porcari. A Tolling of the Bell Ceremony will signal “last alarm” for the fallen first responders. Other program events with Master of Ceremonies Jim Raftis include the National Anthem by Andrea McBride, the Pledge of Allegiance, a welcome by Owego Town Supervisor Don Castellucci, a Benediction by OFD Chaplain George Hall, live taps by VFW Honor Guard Member Dean Morgan, and Amazing Grace by bagpipes concludes the memorial program. A special guest at this year’s ceremony, will also be speaking about three people they lost during the attacks of 9/11. This year’s theme is to Never Forget the 9/11 Victims of Global Terrorism and to honor the Bravest of the Fire and Emergency Service and the Finest of Police Service and make sure all lost in the 9/11 attacks are not forgotten. Members of the public are invited to join local politicians and Fire and EMS personnel at the 17th annual memorial event to honor the firefighters, paramedics, police and those serving the emergency medical community. Those firefighters, EMS and police who responded to the World Trade Center are invited as special guests for recognition for their service and sacrifice. Make your presence known by being in front of the 9/11 Memorial. Be the first to comment on "Remembrance ceremony planned for 9/11"